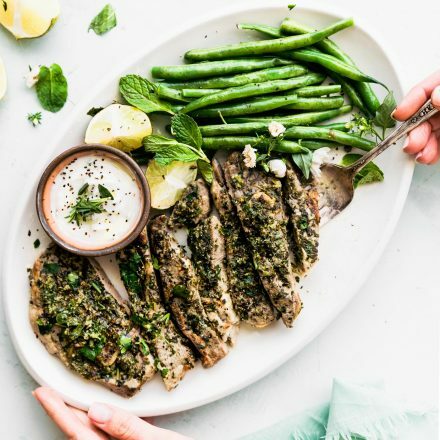 This broiled lamb chops recipe makes a delicious and healthy dinner for Easter or a spring dinner party. This recipe is gluten-free, Paleo, low carb, and Whole30-option. Optional cherry tomatoes to broil with chops. See notes for other vegetable options. Clean your lamb chops and trim any fat from edges, if needed. Place lamb chops in large glass plate or container. Make the mint chimichurri marinade by placing all of the marinade ingredients (minus oil and salt and pepper) into the bowl of a food processor. If you prefer an extra spicy marinade, keep a few seeds from the serrano pepper and place in food processor with other ingredients. Process until well combined. Then slowly add in your oil and salt pepper while processing on low. The marinade should result in a thick sauce with small pieces of herbs still in it. See pictures in blog post. Next, marinate the lamb chops in half of the mint chimichurri sauce marinade for 1 hr to 24 hours. Save the other half for serving. When you’re ready to cook the lamb, place an oven rack 6 inches under the broiler. Turn on the broiler. Place the lamb on a baking sheet or broiling pan and cook under the broiler for 4-6 minutes per side, or until the internal temperature reaches 138 Fahrenheit (for medium-rare). I added cherry tomatoes after broiling for 4-6 minutes, then flipped the lamb over and placed the whole pan back in the oven (with cherry tomatoes) to broil again for an addition 4 minutes. Total broil time 8-12 minutes depending on thickness of chops. This is a great dish to serve with so many great veggies! Serve with balsamic green beans, sautéed asparagus, or roasted Potatoes, etc. You can also serve the lamb with an additional side sauce, like an herbed yogurt sauce or raita. For instant pot version, marinate your lamb chops. Then, select “sauté” and add each lamb chops to the pot. Cook for about 4 minutes per side, until they brown. Add 1/4 c of water or broth and lock your Instant Pot. Cook at high pressure for 5 minutes (depending on the size of your lamb chops).